Maggie and myself; directed of course by Mary Luckhurst, have been working from top to bottom protecting the drapes from the ongoing work. I’ll keep things brief here but the extended version will appear on my own blog very soon (preferably before Christmas!). If I manage to pique your interest and not send you to slumber land here is the link: http://wynpoljourn.blogspot.co.uk/. Anyway, on with the show so to speak. This week it was just Mary and I doing the textiles as Maggie had been taken ill. First off were the lovely curtains in the Yellow Drawing Room as seen here (left). 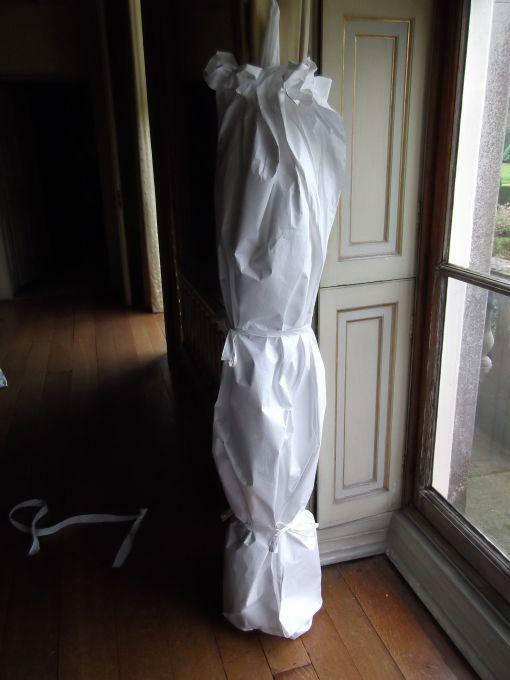 The task here was to create Tyvek bags to fully protect the curtains. Sounds easy? Put it this way, I was glad Mary was able to help me as it’s definitely a two person job! Something I came to realise that afternoon when I was making more bags on my own! Simply put (or as simple as I can make it) we cut a length of Tyvek and fold it in half. When the bag is in place the curtain sits in this fold with the rest of the Tyvek running up the back and front of the curtain. In between the folds of the curtain we place acid-free tissue sausages to pad out the folds to prevent possible creasing of the material. With the sausages in place the two ends of the bag are then folded round and tucked into each other to fully enclose the curtain. A specially created draw string at the top of the bag is pulled tight (but not too tight) to secure it in place. A couple of extra strands of tape (or in this case, Tyvek) are used to prevent the two ends from unravelling, usually tied middle and bottom of the bag. Hey presto! A fully bagged curtain ready for when the contractors move in to do their work. The photo right shows the completed piece. I should also mention we do diversify occasionally and roll some carpets, it’s not all curtains! With the Hall being wrapped up for Christmas this year it’s been a bit too and fro with the materials. I had to borrow the only remaining roll of Tyvek from the lovely volunteers wrapping all manner of things ready for the next two weekends! So a big thank you goes to the ladies for keeping me out of mischief and managing to carry on with the curtains! Unfortunately Mary was preoccupied with other jobs in the afternoon so I pushed on by myself. Moving clockwise from the entrance hall, which had already been spruced up by the house staff, eventually found me in the Long Gallery (I think! If I’m wrong you’re welcome to correct me). One thing that was noticeable bagging the curtains that afternoon was the effect of light damage on the curtain material as seen in the photo below. I know that Julia (Conservation Assistant at Wimpole) is working on a side project to monitor the light levels in each room to see how it affects materials. 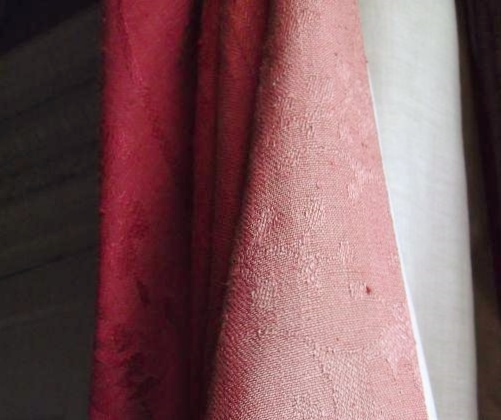 It may be difficult to see from the picture but there is a stark contrast between the lighter fabric on the edge to the true red of the material itself. Hopefully the results of the light survey will highlight the problems of light in a grand Hall like Wimpole. Thanks for reading and hopefully you’ll be hearing more from us soon! 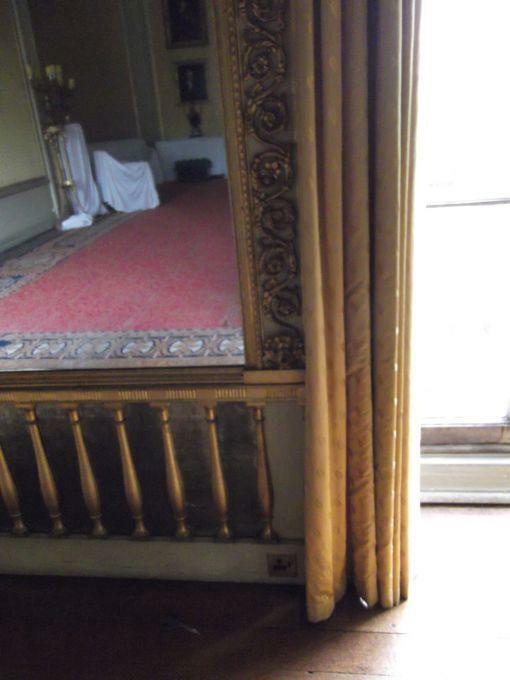 This entry was posted in Conservation, Mansion and tagged cambridgeshire, collections, hall, protected, wimpole by luciackersNT. Bookmark the permalink. Thanks for the update and the interesting update on the process for protecting textiles. It’s a shame about the light damage and hope you find away of protecting the rich colours for the future.